Every now and then I come across something on a site that makes me sit back and say “now that was a really good idea.” It doesn’t happen all that often but you’d better believe I’ll share them with you when it does. Now as you know, I’ve been using AuctionAds for a while now. The ads feature items being sold on ebay and if someone visits eBay via my site and purchases something, I earn a percentage of the profits. Take a look at this method of integrating the affiliate link in with the content of the site. 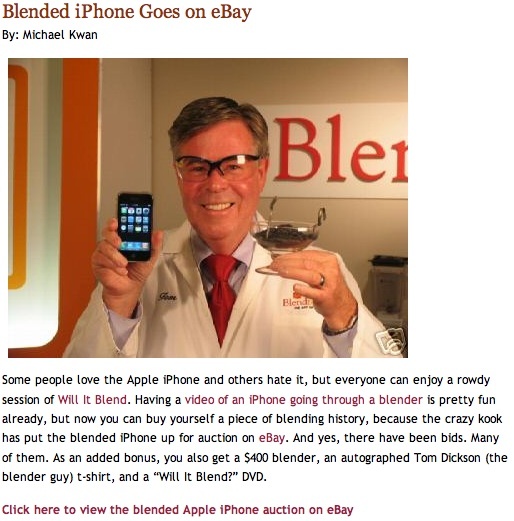 Not only does the post cover a topic that is likely interesting to the blog’s audience, but it entices you to click through to eBay. Not only that, the image is an affiliate link as well. While I’m not an expert, I’m far from a newbie when it comes to affiliate marketing and I almost always spot affiliate links from a mile a way. Not this time. The only reason I figured out what was going on in this post was because I did exactly what I was led to do, I clicked over. When trying to monetize your blog, or any site for that matter, always remember to spend a few moments thinking a bit outside the box. Who knows what you’ll come up with. No problem, it was a great example of how bloggers can market their affiliate offers. Keep up the good work. P.S. Would you be willing to share how much that post made you?